I've enjoyed a long teaching career, first teaching art to high school students in Vermont, and ending my career with a similar position in Shanghai, China, where we lived and worked for seven magical years. I became a full-time artist when my husband and I moved to Asheville, NC in 2006, and I maintain a studio at the Odyssey Center for Ceramic Arts, in the heart of Asheville's River Arts District. We enjoy the outdoors and travel, both of which influence my work. Life drawing has been a long time love. My earlier artwork centered around printmaking and landscape painting, but as the human figure continued to emerge in the work, so did the need to express myself in clay. 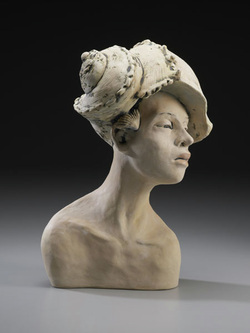 I've enjoyed exhibit opportunities in several cities on the East Coast, and have received awards for my work in clay. My work is in private collections around the US and in Europe. I studied art at SUNY Buffalo (BFA degree) and RIT (Rochester, NY - MST degree). My subjects are always human figures, most often women. Clay and surface preparation offer so many variables—it's a birthing process, a conversation with the clay, with outcomes—gestures and expressions—which delight and surprise me. There is usually a story or allegory behind the figures, but my hope is that the sculpture will intrigue you enough to call up your own stories and interpretations. I hope that my work engages you, and invites identification, reflection and questioning—and enjoyment!